The purpose of this blog entry is to somewhat demystify tropical and sidereal astrology, and some other concepts. To develop Astrod, I needed to grasp a range of astronomical and astrological concepts, and overall this was an interesting journey of discovery, that is worth reporting both in its own right, and also should it help anyone else who finds themselves scratching their head over the same stuff – it took me quite lot of confusion to come to something that is actually relatively simple. The first thing to say is that for the purpose of the research here, the distinction between tropical and sidereal astrology is of little importance. If we are considering the correlations of world transits to historical events, it is a matter of arbitrary convention. The key quantity in a world transit is the difference between the positions of two planets, so any convention adopted as to the origin cancels out. The world transit data generated by Astrod agrees with the ephemeris used by NASA. This is in contrast to the relative confusion of sign based astrology. Natal transit and retrograde motion calculations are robust too, a matter of physics not convention. Only considerations of signs requires delving into the distinction. The (solar) ecliptic is the apparent path of the Sun against the fixed backdrop of the stars, and is the plane of the Earth’s (and most other planets’) orbit around the sun. It is angle to the celestial equator by the tilt of the Earth, and it is this tilt that mean that constellations rise and fall from the sky over the course of the year. The celestial backdrop is a sphere, defined by the celestial equator and the north and south pole stars, and the ecliptic the offset plane of the sun’s path through it, offset due to the tilt of the Earth. This is the basic intuition of it all. To specify the position of a planet, from either the equatorial or ecliptic plane, you need a polar and azimuthal angle (cf longitude and latitude), and astrology uses the longitudinal angle in the ecliptic frame. 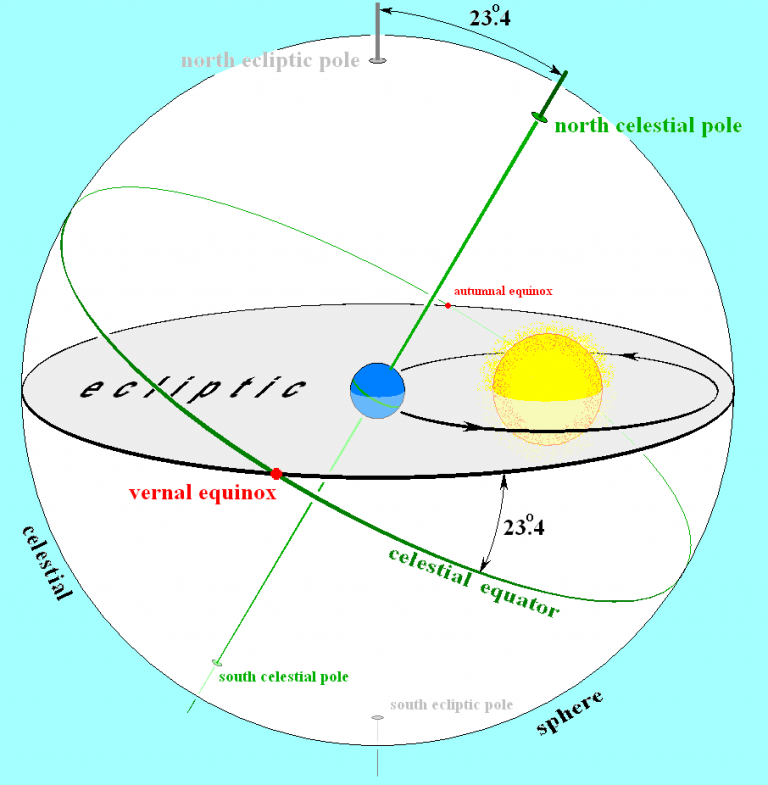 The vernal and autumnal equinoxes (when the days and nights are of equal length) occur at the intersection of the celestial equator and ecliptic. You can see this by thinking of the Earth as ‘straight on’ to the sun, rather than tilted towards or away from it, giving longer days or nights. What makes this all very interesting is that due to its tilt, the Earth precesses. It is a like a gyroscope spinning rapidly, when you tilt it it traces a cone more slowly. The period of the Earth’s precession is approximately 26000 years. This means that very slowly, the position of the ‘fixed’ backdrop of stars moves. Moves with respect to what? Well, for a start, the vernal equinox. It is easy now to get ones head around all of this and leave it at that. But in ancient times, there was no way to do astrology other than by the fixed backdrop of the stars. Not only does that backdrop rotate daily (as the Earth rotates), but very slowly it moves. The stars were the only reference point, so it is clear why their use as a metric was so important. An epoch is a date, with the stars in a corresponding position during their precession relative to the earth. The motions planets can then be shown against this backdrop, for example in a star atlas. Above, no epoch is supplied, and PyEphem uses an epoch defined by the date supplied by default. For illustration, the vernal equinox is taken to be 6am on 21st March. In all cases (returning to 1000AD shortly), the Sun rises on the Pisces Aries cusp. This is exactly the tropical result, and entirely unsurprising – it has come about because 0 degrees is defined to be at the intersection of the celestial equator and ecliptic, and the signs of the Zodiac defined as 30 degree intervals therefrom. For an epoch of 1AD, we see what we expect. Then, the sun rose on the Aries Pisces cusp, and now it rises close to the Pisces Aquarius cusp. Note it is going ‘backwards’ through signs. This is the astronomical meaning of the Age of Aquarius, and we can see it approaches. An epoch of 2000AD gives the ancient perspective of precession as if we had constructed the Zodiac based on where the Sun rises now. The intersection of the celestial equator and the ecliptic is also known as the Point of Aries, on account of the perspective when the Western Zodiac was constructed. If the slow precession of the equinoxes means that the Sun slowly changes the position it rises in, there must have been a point at which the point it rose at coincided with the fixed grid of the tropical system, a passing moment when tropical and sidereal coincided. Slightly disappointingly, we can’t know this point (which is known as the fiducial point), for the simple reason that the signs themselves, as seen in the sky, don’t have fixed beginnings and ends but rather denote regions. Tropical astrology uses the simple convention explained above, whereas sidereal systems are non-trivial and require another reference point. For a much more detailed discussion, see the Swisseph documentation. This means that the above only illustrates the coming Age of Aquarius, but can’t say when it will occur, for the reason that 1AD is roughly the time that the Sun rose between Pisces and Aries, and that the actual signs as seen in the sky, with uneven widths and gaps, can only mark a broad age. The point of all of this is not great. It is bordering on obscurity, but it shows some fascinating historical relics, from times when not only was astronomy vitally important for navigation, calendar keeping, astrological divination etc., but a challenge that is hard for us to appreciate – try and get your head round all this without any mental reference to the heliocentric model. You appreciate the difficulty and impressiveness of the understanding of the heavens that was gained by almost all ancient cultures, including amazing things like the prediction of eclipses (see Denis Klocek’s Climate: Soul of the Earth for a good discussion of the intuition of eclipse occurence). The astrologers of ancient India knew about the precession of the equinoxes, and accounted for it. The ancient Greeks also knew about it, but Ptolemaic astrology did not account for it. To end this little delve, what are we to make of the signs? On the one hand, they seem problematic. If you are told you are a Leo, the Sun was in Leo at your birth, if you had been born roughly 2000 years ago. This sort of thing can give astrology a bad name. One of the more convincing ideas I have heard is that the characteristics associated with the signs actually represent a consensus on seasonal effects. There are plenty of indications of these in biology, with a degree of seasonal effect on character quite plausible, for example whether you are born in summer or winter is likely to have some impact. More speculation on the nature of astrological influence will follow. Overall I am much less concerned with sign and house based astrology than world transits. But making sure I at least understood the issues taught me a lot, the essentials of which are sketched out here.